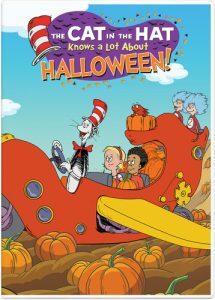 The Cat in the Hat takes Nick and Sally on the craziest Halloween ride filled with howlers and shockers and scary fandangle’s, big laughs and music and fun from all angles! Their fright-filled adventure takes them deep into the Oooky-ma-kooky Closet where Nick and Sally discover the very best Halloween costumes ever. KIDS FIRST! Film Critic Carla P. comments, “The message of this film is to get over your fears because they are not as big as you think. It teaches kids that you can get over your fear whether it’s a small fear of ghosts or a big fear like stage fright. “ See her full review below. 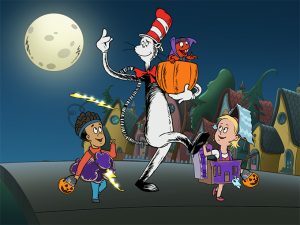 The Cat in the Hat Knows a Lot About Halloween is a wonderful Halloween movie for children. The theme is about facing your fears because they are not as big as you think. That is what is interesting about the film. The storyline is about two kids named Nick and Sally who need to find the perfect Halloween costume. They find the Cat in the Hat and he tells them about a closet that has all the best costumes. They go on the hunt for the perfect costume and face their fears on the way. The characters are very unique, creative and beautifully animated. Some of them are astonishing. I love the wacky and crazy lady who owns all the costumes. She’s very helpful to the kids as she helps them find the perfect costume. I love how she dances with the Cat in the Hat. She is a fun, energetic, loving character that children will love. 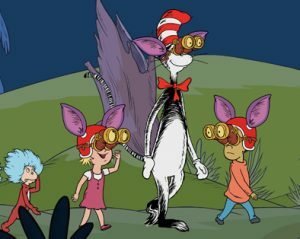 The Fish that follows The Cat in the Hat on his journeys is also hilarious! 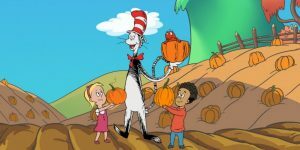 I love how he tries to scare The Cat in the Hat but he is so oblivious about his fear of pumpkins. The anim ation is close to the Cat in the Hat books. The storyline is identical to the books, which doesn’t always happen when you make a book into a movie. There are some movies that do not look anything like the original book. The voice acting is applaud-able. I love how Martin Short’s (The Cat in the Hat) voice is exactly how I imagine the Cat in the Hat would sound. I love how he sounds whimsical and kooky. I also adore the voice actors of Sally and Nick. I love how they make their voices so perfectly childlike. The messag e of this film is to get over your fears because they are not as big as you think. It teaches kids that you can get over your fear whether it’s a small fear of ghosts or a big fear like stage fright. All of the main characters get over fears that they couldn’t get over before. 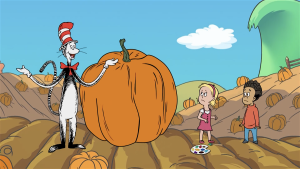 The Cat in the Hat gives great advice – the fears you have are not bigger than you think. This is a great lesson for kids that have fears that they cannot get over. I rate this film 5 out of 5 and recommend it to ages 5 to 9. This DVD is available now so, be sure to check it out. I always get super excited about watching this series. Martin Short is the brilliant voice actor of The Cat in the Hat and he’s hilarious. In general this series has always been very fun and educational, so it’s not a shock the this Halloween special follows suit. In this episode we learn the science behind things such as the changing colors in fall. I am very happy that the story features creepy crawlies and monsters and still makes it fun and fearless for children. Fear is actually a large part of this episode. 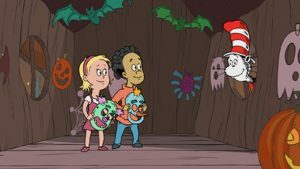 The Cat in the Hat and the kids addre ss scary costumes and how to overcome those fears. Their adventure consists of a really cute camping trip complete with adorable squirrel interactions and teaching respect for nature and wildlife. This is perfect for ages 3 to 10 and I give it 5 out of 5 stars for being fun and educational! 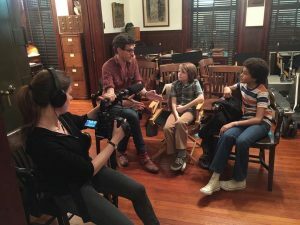 This film offers a rare glimpse into the relationship between beloved children’s author A. A. Milne (Domhnall Gleeson) and his son Christopher Robin, whose toys inspired the magical world of Winnie the Pooh. Along with his mother Daphne (Margot Robbie), and his nanny Olive, Christopher Robin and his family are swept up in the international success of the books; the enchanting tales bringing hope and comfort to England after the First World War. But with the eyes of the world on Christopher Robin, what will the cost be to the family? KIDS FIRST! Film Critic Benjamin P. comments, “You may think this is about the creation of Winnie-the-Pooh, which it is, but it is also about how the beloved bear’s sharp rise to fame affected the family of A.A. Milne and the writer’s own struggle with post-traumatic stress disorder.” Morgan B., adds, “Christopher Robin has a story with a magnificent heart, which is filmed brilliantly. I felt as if I was in England. I cried countless times because the characters are so relatable and there are many touching moments. The acting, photography and graphics are downright superb.” See their full reviews below. Goodbye Christopher Robin is a great film with top-notch performances from its A-list cast. You may think this is about the creation of Winnie-the-Pooh, which it is, but it is also about how the beloved bear’s sharp rise to fame affected the family of A.A. Milne and the writer’s own struggle with post-traumatic stress disorder. 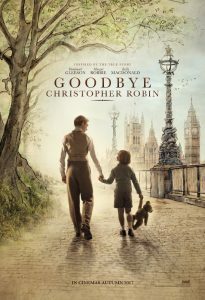 G oodbye Christopher Robin follows Milne’s young son and his playwright father who finds it difficult to pen any new plays after his experiences in World War I. Father and son begin to spend time together playing in the woods around their new home in the British countryside. Soon, Milne has his friend and fellow soldier, illustrator Ernest Shepherd, visit his homestead to craft stories based on the Milne family’s imaginative woodland adventures. Thus, Winnie-the-Pooh is created and a cultural icon is born. Milne gives his own son’s name to Pooh’s best fictional friend. Suddenly the press and public are eager to meet the real Christopher Robin. The onslaught of interviews and the dwindling time spent with his parents take a toll and he has trouble coping. Domhnall Gleeson is great as A.A Milne. He shows us the effects PTSD can have on veterans and their everyday lives. Gleeson shows us the transformation from the playwright who feels lost in what he will do next to the author on top of the world grappling with how to deal with his fame and his faltering efforts to be a good father. Kelly Macdonald is also excellent as Christopher Robin’s angelic and kind nanny, Olive. She is really the only one watching out for Christopher Robin. Olive has a positive glow that stays strong to the end of the film. She is my favorite character and I compliment Macdonald on making the relationship she has with Christopher Robin so heartwarming. 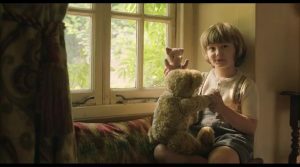 I give Goodbye Christopher Robin an age rating of 12 to 18 for some subjects that could be troubling for younger audiences. If you’re looking for a bright testament to the legacy of Winnie-the-Pooh and the magic of childhood, this is not that film. But Goodbye Christopher Robin is an insightful, historical, sometimes dark drama that goes into other important topics. I give Goodbye Christopher Robin 4 out of 5 stars. It opens in theaters October 13. A creative imagination and playing games is fun, especially when you add the people that you care about your fun adventures! This is a story about what happens when someone takes those thoughts, turns them into books and shares them with the world. Goodbye Christopher Robin has a story with a magnificent heart, which is filmed brilliantly. I felt as if I was in England. I cried countless times because the characters are so relatable and there are many touching moments. The acting, photography and graphics are downright superb. They bring this true story to life. War is devastating for everyone, especially the families of the soldiers. One of the worst wars in history was World War I. A.A. Mile returns from the war to rejoin his family and friends and has a hard time adjusting to normal life. Once he joins his son’s world of fun and adventure, starring a fluffy bear, he reconnects with his son and finds joy. A.A. Mile wrote Winnie the Pooh stories for his son. They were so good that he published them. He wanted to share his new-found joy with the world and make others happy. The war caused much heartache and Winnie the Pooh made people smile. He thought it would also make his son happy. 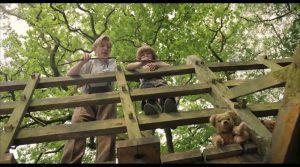 The cinematography and graphics in Goodbye Christopher Robin are fantastic. The scenes of the woods are very vivid with lots of brilliant colors. The scene when the snow suddenly drifts into the air to make springtime is terrific. I was surprised with its beauty. I love seeing snow fall in reverse. The acting is fabulous. Each performer seems to have the perfect personality for their character. 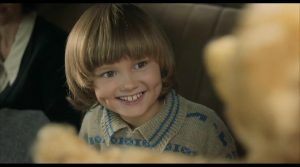 Christopher Robin (Will Tilston) is adorable and huggable just like Winnie the Pooh. His happiness with his stuffed animals jumps through the screen and makes you smile. He looks like the Christopher Robin we see in the books. A.A. Milne (Domhnall Gleeson) is played as a stern man. He wants his son to be happy, but he also wants to turn Winne the Pooh and his son’s stuffed animals into wonderful stories. His muse is his son. Through him he heals from the war and finds his voice again as a writer. He wants to find fame as a wonderful children’s writer who brings joy to those who thought there was no joy left in the world. This is played perfectly because you hate him and feel sorry for him, at the same time. Olive (Kelly Macdonald) is shown as the kind nanny who wants nothing but the best for Christopher Robin and treats him as if he is her own. She tiptoes a fine line between friend and paid help. I love her accent. Christopher Robin’s Mother, Daphne Milne (Margot Robbie) wants fame and money. She has no motherly skills, but she does try. At times, she doesn’t appear to care if Christopher Robin is okay, just as long as he does what he is told. She is thrilled with the New York Times articles and numerous invites for her family to attend events. I resonated with her emotions. Her crying scenes had me in tears. Older Christopher Robin (Alex Lawther) portrays his role in a very serious way. He creates an emotion of uncertainty. I could not decide if I liked him or not. Great acting sometimes creates an emotional roller coaster ride. The best part of this film is when Christopher Robin and his father are in the woods making a door for owl’s house. If you are a fan of Winnie the Pooh like I am, it is thrilling to see all the different adventures come to life. I recommend this for ages10 to 18. It is a complicated and emotional story. Adults will love the scenery, the acting and the cinematography. I give it 5 out of 5 fluffy Winnie the Pooh hugs. This film comes out in theaters October 13, 2017 so, go check it out. 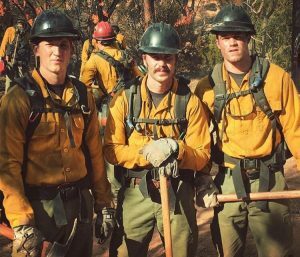 Through hope, determination, sacrifice and the drive to protect families and communities, the Granite Mountain Hotshots become one of the most elite firefighting teams in the country. 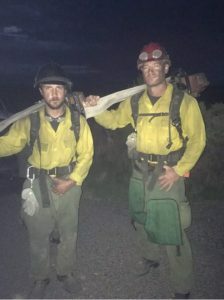 While most people run from danger, they run toward it — watching over lives, homes and everything people hold dear, forging a unique brotherhood that comes into focus with one fateful fire in Yarnell, Ariz. KIDS FIRST! 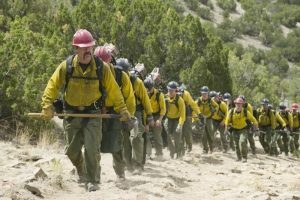 Film Critic, Abraham F., comments, “Only the Brave is a breathtaking film about 20 firefighters who lost their lives to the Yarnell mountain fire on June 30, 2013 bringing a whole new meaning to the term “a good movie.” The character development and practical effects are stunning.” See his full review below. The film takes time setting up each of the characters, making them feel very well developed. The use of practical effects makes the movie seem more real, because real fire is used instead of CGI for the fire. The characters also act like true heroes and seem very real. 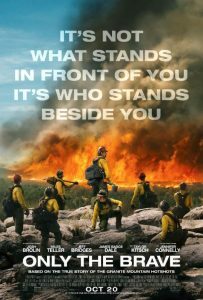 The storyline is about a group of firefighters who want to become ‘hotshots,’ which are the elite group of firefighters that work in the fire itself. When it comes time to assess them, their Chief doesn’t agree with the assessor’s opinion on not burning the wood and takes his own path which risks having their certification taken away. But the chief thinks it’s better to do it that way so they burn the logs, making the correct choice in the situation and, as a result, they get their certification. After that, they go into many dangerous wildfires to protect nature and homes. One day when the Yarnell Mountain fire comes on June 30, 2013, they are especially challenged. Josh Brolin portrays Eric Marsh the fire chief. He has proved his skill in many movies including Thanos in Guardians of the Galaxy and as Beck Weathers in Everest. Miles Teller, the actor for Brendan Mcdonough, the protagonist, has been in Footloose and The Divergent series which were both huge hits. One interesting thing about this film is its timing. I live in Northern California where huge fires in the North Bay have left many people homeless and injured. Another interesting thing is that Only the Brave is one of the movies in the 21st century with the most practical effects. The message is to get awareness for the firefighter community, which it got 100% loud and clear. Kids will be influenced to save people’s lives. There isn’t much reckless behavior except when someone falls asleep while driving. I recommend this for ages 12 to 18 who will understand the shear force of the message of this film, although I think it was intended more for an adult audience. This movie is fantastic and I am happy to give it 5 out of 5 stars. This movie hits theaters on October 20, 2017 so go check it out. The story of a young boy in the Midwest is told simultaneously with a tale about a young girl in New York from fifty years ago as they both seek the same mysterious connection. KIDS FIRST! 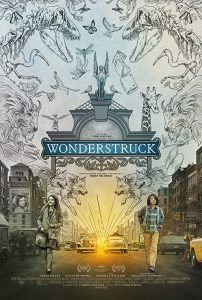 Film Critic Clayton P. comments, “Wonderstruck is a shining gem in the cinematic “cabinet of wonders”… I love this film because it combines the artistic style of old black and white silent films with the more modern color palette of today’s films.” Dariana A. adds, “Wonderstruck is such an amazing and inspiring movie. It has a great plot that is very inspiring to all kids. In the beginning, the story takes a while to develop so it’s a little slow. Once you get to the climax, there is never a dull moment.” See their full reviews below. 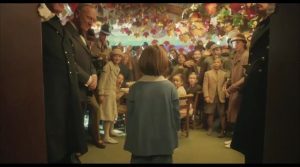 Wonderstruck is a shining gem in the cinematic “cabinet of wonders.” The film is adapted from the book Wonderstruck by Brian Selznick, the same author who wrote Hugo Cabret. Directed by Todd Haynes and written by Brian Selznick, the film envelopes you in its beautifully detailed vision of old New York. 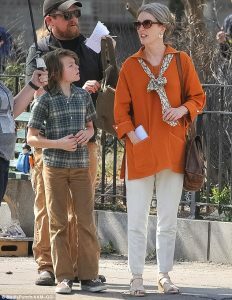 The movie stars Oakes Fegley, Julianne Moore and Michele Williams. I love this film because it combines the artistic style of old black and white silent films with the more modern color palette of today’s films. 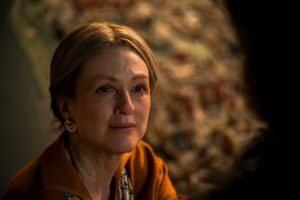 Wonderstruck tells two similar stories that have a connection. One story concerns a twelve-year-old boy, Ben, in the 1970s, who, after losing his Mom, decides to run away and look for his father in the big city. Recently losing his hearing from a lightning strike, he must deal with his disability without knowing sign language. Luckily, when he arrives in NYC he makes a friend, Jamie, who takes him to the American Museum of Natural History. The other story follows a young girl, Rose, in the late 1920s. It is portrayed as a silent black and white film, as befits the time period. Rose is born deaf and never learned sign language or how to properly talk, but she is talented at creating artworks with paper. She is depicted as a very shy, quiet type, but loves visiting her brother who works at the Museum of Natural History. This film reminds me of Hugo and The Night at the Museum because of the attention to historical detail and the wonder inherent in the natural world. I also enjoyed how it keeps changing from a silent, black and white film to a talky, color film. It gives you the best of both worlds – old style filmmaking and more modern. Each time the film shifts time periods, the music changes as well. The film revels in many different textures, such as the gritty reality of NYC in the 1970s, all the old curiosities in the Museum of Natural History and even the paper cityscapes that Rose creates. The crux of the film is the director’s fascination with the old “cabinet of wonders” and how it is the precursor to the modern museum. This film itself is a “cabinet of wonders,” revealing many treasures in its depths. My favorite scene is when Ben and Jamie explore the secret rooms in the Museum of Natural History. 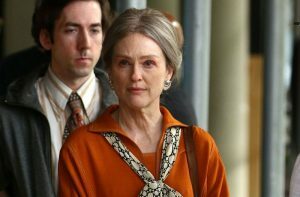 Before Wonderstruck, I was not familiar with the director, Todd Haynes. Until now he has created mostly sophisticated, art house, independent films. This film can be considered a fascinating, art house, family film. I give Wonderstruck 4 out of 5 stars for its creative way it combines two different artistic styles. I recommend it for ages 12 to 18. It opens October 20, 2017 in select theaters nationwide so look for it. Wonderstruck is such an amazing and inspiring movie. It has a great plot that is very inspiring to all kids. In the beginning, the story takes a while to develop so it’s a little slow. Once you get to the climax, there is never a dull moment. If you stick around, it’s an awesome movie! It also is a little hard for kids to understand, but if you are over 10, you should be able to follow it. 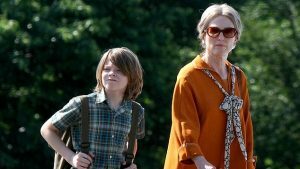 Wonderstruck is a story about a boy named Ben who gets in accident in 1977 which causes him to become deaf and inspires him to run away in search of his father. This story intertwines with another, set in 1927, about Rose, a young deaf girl who runs away looking for a mysterious woman whose scrapbook she has. As the story progresses, we find out more about how their stories really are alike. One of the many stunning things about Wonderstruck is the cinematography. The way they change from a silent film (Rose’s story set in 1927) to a movie that is set in a future time (Ben’s story set in 1977) is seamless. 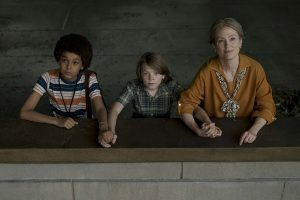 All the actors bring so much to the characters they play, especially Oakes Fegley (Ben) and MIllicent Simmonds (Young Rose) who are child actors and perform beautifully. Another marvelous thing about this movie is that it really gives you a look into what it’s like to be deaf. Rose’s story is a silent film, so you have to read people’s facial expressions to know what they are trying to say. During Ben’s time, there are moments where you can hear what Ben hears, which is almost nothing except for very faint sounds. Wonderstruck really gives you a glimpse into deaf people’s lives and you learn to relate to them through the filmed story. 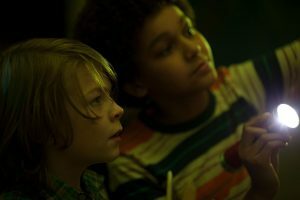 My favorite character is Jamie (Jaden Michael) because he is Ben’s friend throughout the whole movie and that is his whole purpose – to be there for Ben. My favorite scene is at the end when Ben is standing on the rooftop of a museum with Jamie and another person (I won’t say who because that’s a spoiler) and they are watching fireworks in the Queens’ skyline. I love it because of its beautiful cinematography. The message of this film is that you may not always find what you’re looking for, but what you do find, might be better. This is a really fortune cookie message, but it’s the message I got because both Rose and Ben don’t find exactly what they are looking for, but still find something great. I give this film 4.5 out of 5 stars because it has stunning cinematography, star power, great acting and gives you a peek into what it’s like to be deaf. I would give it an extra .5 if the beginning wasn’t so slow. I recommend this film for ages 10 to 18. It opens in theaters nationwide October 20, 2017 so be sure to check it out. 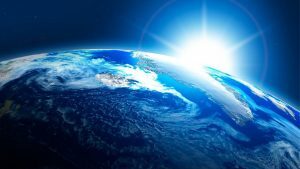 Earth: One Amazing Day – Beautiful and Touching Reminder of the Amazing Planet – Earth! 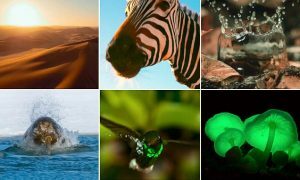 From BBC Earth Films, the studio that brought you Earth, comes the sequel – Earth: One Amazing Day, an astonishing journey revealing the awesome power of the natural world. Over the course of one single day, we track the sun from the highest mountains to the remotest islands to exotic jungles. Breakthroughs in filmmaking technology bring you up close with a cast of unforgettable characters. Told with humour, intimacy and a jaw-dropping sense of cinematic splendor, Earth: One Amazing Day highlights how every day is filled with more wonders than you can possibly imagine- until now. KIDS FIRST! Film Critic Jolleen M. comments, “Earth: One Amazing Day is a beautiful, informational film that makes you really appreciate Earth and know more about it. This film captures nature in all its beauty and is simply breathtaking. This film is very touching, suspenseful and pleasurable.” Rohan F. adds, “The film features amazing cinematography, stunning graphics, and the audio quality at the screening I saw was brilliant thanks to the Dolby theatre vast speaker system. It had different layers of sound played at the same time creating a very realistic vibe.” See their full reviews below. 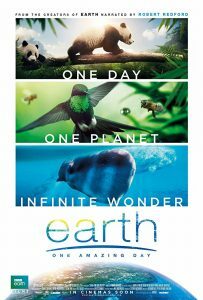 Earth: One Amazing Day is a beautiful, informational film that makes you really appreciate Earth and know more about it. 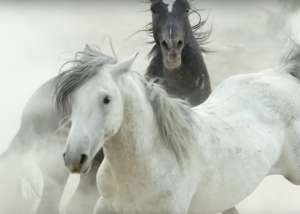 This film captures nature in all its beauty and is simply breathtaking. This film is very touching, suspenseful and pleasurable. There is comedy, action, adventure, romance and non-fiction all in one film. There is something for everyone to enjoy! This film explores all the aspects of one day on Earth. It follows the lives of different animals including iguanas, baby lizards, zebras, giraffes, lions and many more. The film shows all the struggles in nature, but also the wonderful and amazing parts. It makes you see the beauty of nature and makes you curious about what’s out there. The people who responsible for filming this, Robin Cox, Kevin Flay and Flying Glass used their cameras to capture the beauty of Earth. Doing this is a real challenge, but they managed to capture so much detail and were able to get incredible close ups. They recorded at different angles, which makes the whole film visually pleasing and close to what it’s like if you were actually there. I also loved the narration of Jackie Chan and Robert Redford. Their voices are very mellow, blends in with the music and overall just fits perfectly for this film. The events that capture are very cool. I especially like how the camera work shoots at different angles so you get a different perspective on the world. The film’s visuals are very colorful and intriguing. My favorite part is when the giraffes fight over the land and the ladies. I like this scene because I learned something new. I had no idea that giraffes could bend their necks so much or that they would just swing their heads around to fight. It was really amusing to see their heads swinging around everywhere, but a little sad to see that they were bleeding. The messa ge of this film is to acknowledge the Earth and realize how lucky we are to be here. There are so many wonderful things happening around us that we don’t notice. The film reminds us to stop and smell the roses and to make sure to protect the earth’s beauty so future generations can enjoy it as well. I loved watching this film so much. It really touched my heart and made me realize how beautiful the Earth is, on just one amazing day. I give this film 5 out of 5 stars and recommend it for ages 3 to 18. I’m sure that everyone will enjoy this film, even adults. Definitely make sure to check it out. It opens nationwide in theaters October 6, 2017. 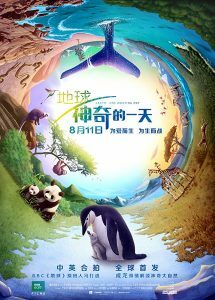 Earth: One Amazing Day is an incredible feature length documentary that is a sequel to Earth, an acclaimed movie based on Planet Earth, the famous series of BBC wildlife documentaries shown on networks and in schools worldwide. The film features amazing cinematography, stunning graphics, and the audio quality at the screening I saw was brilliant thanks to the Dolby theatre vast speaker system. It had different layers of sound played at the same time creating a very realistic vibe. 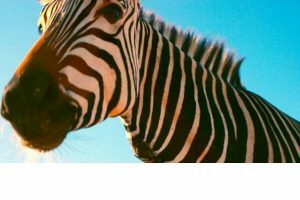 Earth: One Amazing Day follows a huge variety of animals and the challenges they must face during a single day. It shows how animals are impacted by the rhythms of the sun and how it provides life to all creatures. It starts off early in the morning following marine iguanas. 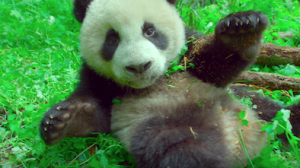 It then brings you to midday where we get an amazing view of a giant panda and her cub eating bamboo. Next, we get a view of a zebra and her foal attempting to cross a rushing river to get to where the grass will grow next. It continues telling different stories for every animal it shows. My favorite scene is when it shows a group of bears scratching on trees to music. The scene is hilarious and is very well edited so that the bear’s movements appear to go to the music. The documentary is narrated by Academy award-winner, Robert Redford. The pauses he leaves between his words are timed brilliantly creating a dramatic atmosphere for each tale. Earth: One Amazing Day was directed by Richard Dale, Peter Webber, and Fan Lixin. This is currently one of the biggest collaborations on a film between China and the United Kingdom. The Chinese version is voiced by Jackie Chan who is known across the world for his martial arts movies. T he music matches the scenes seamlessly. I love how they tell a short story with each animal and how it makes the viewer invested in each and every one of them. They use clips taken over the course of several days and make them appear as one scene. The moral of this film is that there is beauty all around us that can be seen every day. We must only look around us to see it. I feel that this is an important and inspirational message to appreciate our world, this isn’t being said enough. I give Earth: One Amazing Day 5 out of 5 stars for its unbelievable graphics and storytelling. I recommend it to children ages 6 to 18 and think that adults will also really appreciate the beauty of this documentary. 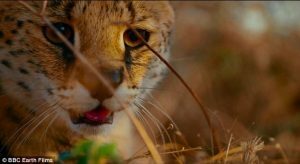 Posted in Feature Film Reviews | Comments Off on Earth: One Amazing Day – Beautiful and Touching Reminder of the Amazing Planet – Earth! You are currently browsing the KIDS FIRST! News weblog archives for October, 2017.